The original game stars an orphaned teen boy and his tsundere twin sister who return to their grandfather’s rural village where the boy develops romantic relationships with his sister, a reacquainted childhood girl friend, and other girls in the neighborhood. 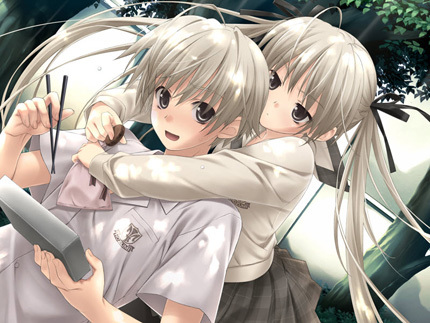 Yosuga no Sora is a visual novel (sometimes referred to as a “dating sim”) like hundreds of games before it. You take on the role of some boy, meet a bunch of girls, and eventually end up in a romantic relationship with one of them based on your decisions over the course of the story. Unlike Kira Kira, Yume Miru Kusuri, Kana – Little Sister, Hourglass of Summer, or Family Project, all of which I have played, Yosuga no Sora has not been officially localized, and thus even when I get my copy, I won’t be able to understand it. 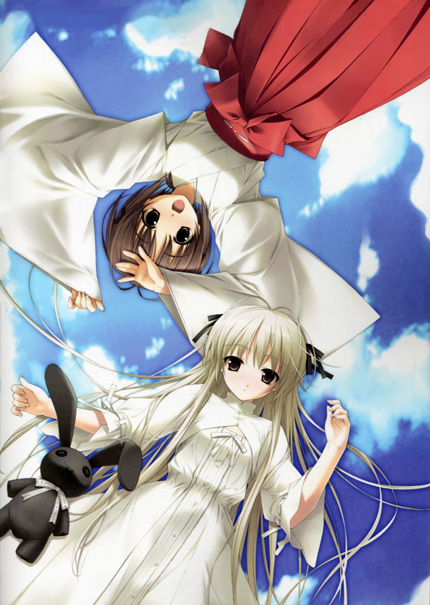 But somehow, Yosuga no Sora has influenced me more than all those other visual novels put together. How is this even possible? I only have vague hints of what the different routes of Yosuga no Sora are about, thanks to the reviews of Nargrakhan and others who are fluent in Japanese. It’s supposedly a story-driven “imouto game” (featuring the protagonist’s taboo relationship with his little sister) and one of the finest examples of the genre, but without actually having played it, I don’t actually know this for myself. 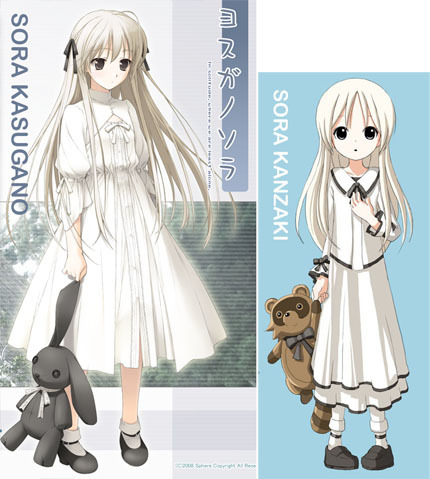 The two cover girls (and presumably, the principal love interests) of Yosuga no Sora are Sora Kasugano, the protagonist Haruka’s tsundere younger twin sister, and Akira Amatsume, Haruka’s cheerful and absent-minded childhood friend who is also a shrine maiden. Sora and Akira are designed to appeal to fans of certain character types, but that alone is not enough to win someone’s devotion. I mean, how many flat-chested tsundere girls are there in the world of anime? And how many cheerful shrine maidens? 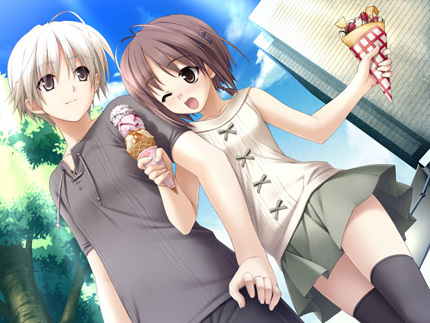 This may sound kind of shallow, but I like Yosuga no Sora because it just looks better than pretty much every other visual novel out there. Of course, “looks better” is partly a matter of taste, but when your artist is Takashi Hashimoto, who’s worked as a key animator on everything from Ghibli’s Ponyo to J.C.Staff’s Honey and Clover and Rescue Wings, you can expect great-looking stuff by any standard. Edit: Apparently the key animator Takashi Hashimoto and the VN illustrator Takashi Hashimoto are different people. I guess I drew the wrong conclusions from the ANN page. I mean, view the larger version of this image and just appreciate this guy’s skills. Just gorgeous. I guess I seem kind of shallow to be won over by beauty alone, and feel kind of what Stripey feels when he says he would put up with abuse from Louise (from Familiar of Zero) simply because she was beautiful, or like a girl simply because she was a loli with light-colored hair. 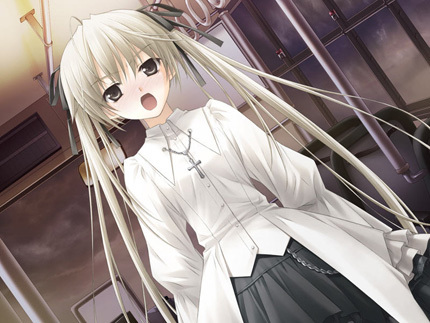 Everyone is swayed by appearances to some degree, and Yosuga no Sora is just off the charts when it comes to appearances. 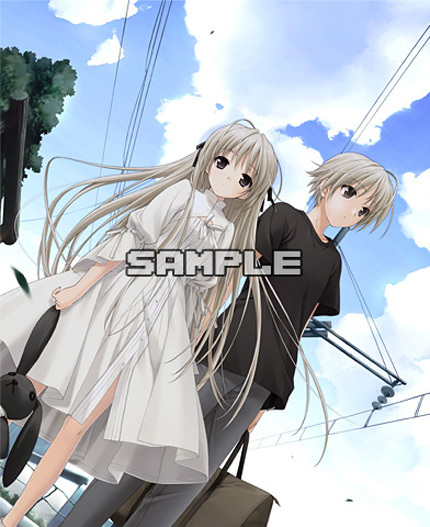 Part of me is preparing to be let down when the Yosuga no Sora anime doesn’t quite capture the beauty of the game’s artwork. Perhaps I’ll feel bad when the story turns out to be mediocre dating game adaptation fare far beneath the likes of Kana or Family Project. But the fact remains that Yosuga no Sora made me understand Stripey’s sister-complex when it comes to anime characters. It made me spend money to get a game I couldn’t play, along with its soundtrack and a bunch of Toho games. The music, some of which is just as beautiful as the artwork, inspired me to make my own feeble cover. And it made me try to draw like Takashi Hashimoto (though I can’t really compare to his skills, as you can see). You ever hear “Movie X had an okay story, but the special effects just blew my mind”? 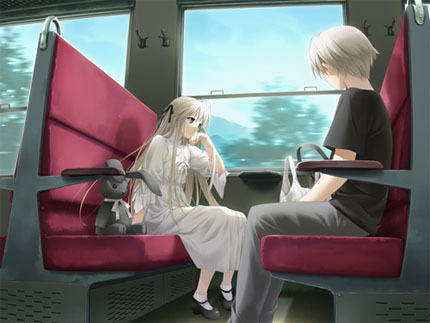 Yosuga no Sora may turn out to be simply average beneath its shining outward beauty, but sometimes, beauty is all it takes to win someone over. Maybe there is truth to the statement “Beauty is truth”, after all. And isn’t “cute makes right” a statement in a similar vein? P.S. What are the odds that J.C.Staff is the studio that’s been picked to handle the anime adaptation? This entry was posted on Monday, May 24th, 2010 at 8:38 pm	and is filed under Pro Artists. You can follow any responses to this entry through the RSS 2.0 feed. You can skip to the end and leave a response. Pinging is currently not allowed. Is the Takashi Hashimoto from this game really the same person as the animator? I can’t check EGS at the moment so I’m not sure what else he drew, but that’s pretty incredible. 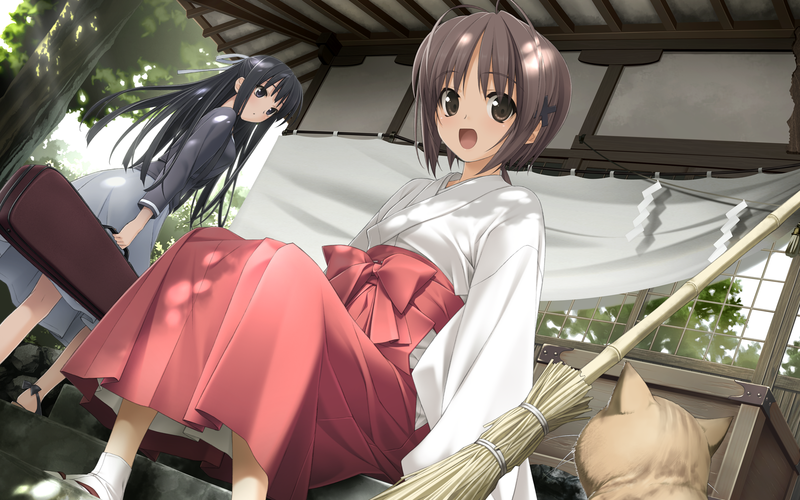 Like you (and pretty much everyone else excited about this game), the visuals are the one thing that made Yosuga no Sora catch my eye, to the point that I didn’t even know what it was about until recently. I’m even more interested after hearing that Sora is a tsundere… I normally don’t go for those types, but it’s incredible when it’s done well. I’m pretty sure YNS Takashi and animator Takashi are the same person; the ANN database gives him as the original character designer for the Pia Carrot movie, which is based on Pia Carrot 3, a dating sim for which he was the illustrator. And yes, the Hiro Suzuhira he collaborated with on Pia Carrot is the same Hiro who assists him in illustrating Yosuga no Sora. Edit: Actually they’re different people. See someone’s corrections below. I’m guessing the ANN entry incorrectly includes the Pia Carrot movie under the entry for Takashi Hashimoto the animator. Either that or the Japanese wiki is wrong, which is unlikely. Takashi Hashimoto’s other visual novel credits include White Breath With Faint Hope. 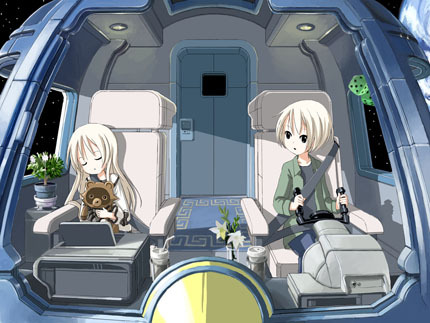 Cuffs, the VN studio that produced Yosuga no Sora, is known for getting only the best artists to illustrate their games; see also Gayarou, and Kantoku (of After School of the Fifth Year). Hmm … Well, just glancing over the thumbnails, I can certainly see how the art-style has influenced your artstyle. Definitely gorgeous, in any event. @hm: I stand corrected. Fixed the post above. Woah late as usual but no less excited! Thanks for the heads up! Saw the PV on Youtube and though FEEL did a fantastic port of Sora’s design to anime. Like yourself, I know next to nothing about the game but was very impressed by the visual. PVC Sora-chan can attest to that!